Action has been taken against an alleged Islamist terror plot in the UK that could have happened at Christmas, counter terrorism sources say. Four men were arrested early on Tuesday in South Yorkshire and Derbyshire. 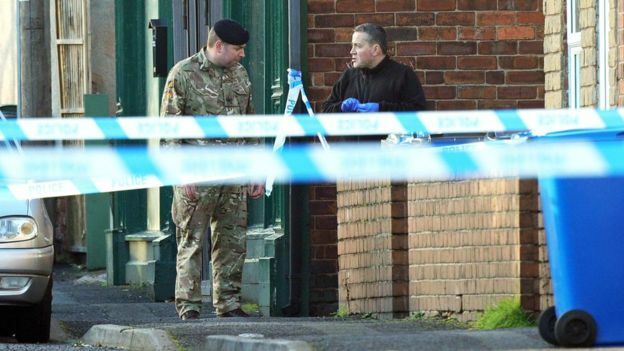 An Army bomb disposal team cordoned off a street in Chesterfield where a 31-year-old man was arrested. Nearby homes were evacuated. 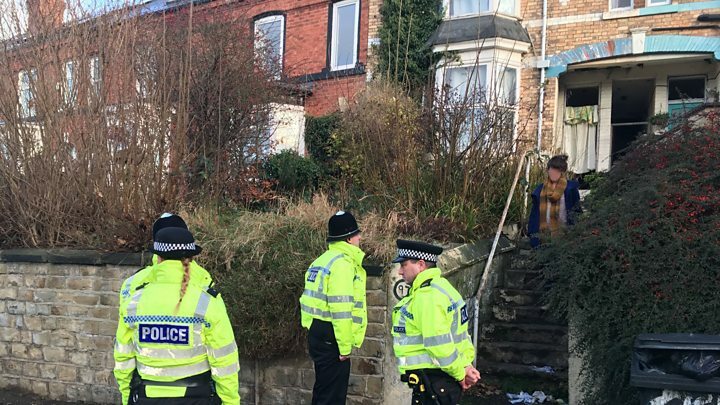 Three other men aged 22, 36 and 41 were arrested in the Burngreave and Meersbrook areas of Sheffield. All four suspects were detained on suspicion of being concerned in the commission, preparation or instigation of acts of terrorism under Section 41 of the Terrorism Act 2000. They have been taken to a police station in West Yorkshire for questioning. The cordon in Chesterfield was later lifted. 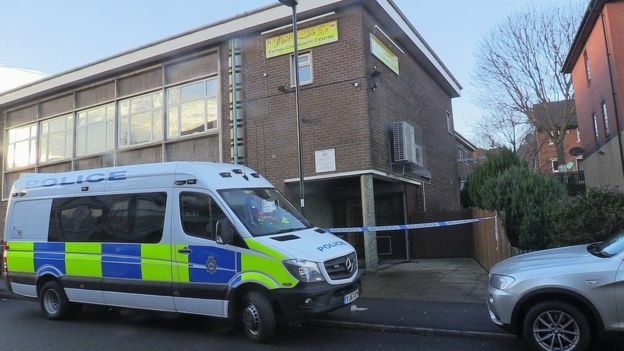 The cordon around one of the properties – the Fatima community centre on Brunswick Road in Burngreave – was extended on Tuesday afternoon and the bomb disposal unit attended. A large number of police vehicles and officers were outside the two-storey building. The main door appeared to be broken on the ground. Four men were arrested – all at their home addresses. At 21:30 GMT, police said searches had been stood down for the evening but would resume at the scenes in Burngreave and Chesterfield in the morning. A neighbour in Shirebrook Road, Sheffield, reported hearing “an enormous bang” as one of the raids took place at 05:30. Carol Perry, who lives two doors from the scene, said: “I was asleep and then I was woken suddenly… and the house shook. 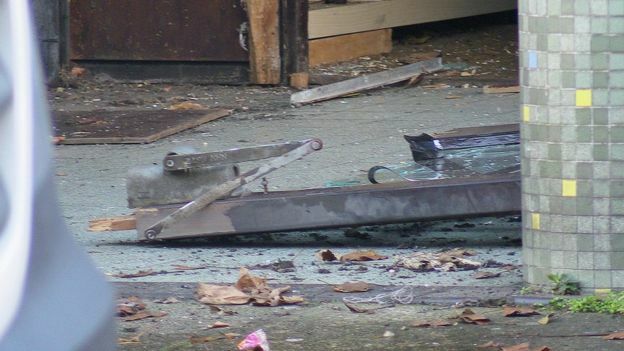 A spokeswoman from Counter Terrorism Policing North East said: “The public may have heard a loud bang at the time as police entered one of the properties, but it was not an explosion. Retired Joan Miller, 63, who lives opposite the run-down house, said she looked out of her window to see many plain-clothed armed officers in the street. Ms Miller said: “[There] was very loud bang. It shook the house. She said the officers shouted “very abruptly” for people to stay in their homes. Elizabeth Fogarty, who lives across the road from the house in Meersbrook, said: “I’ve only recently moved up from London. There are two types of terrorism raids in the UK. Many occur very quietly as detectives knock on the door and take the suspect into custody under normal police powers. Then there are the full-on raids where doors or windows have to be knocked in, cordons set up and the bomb squad called. Such operations are only ever mounted because secret intelligence – perhaps from an intercepted communication and often only fragmentary – suggests there is something at a property they need to get to the bottom of. None of which is proof that any of those who have been arrested have committed an offence – but officers now have up to 14 days, subject to court oversight, to build a case. One of their priorities is likely to be forensically examining phones. All recent major terrorism investigations have turned on not just what officers found during searches, but what they uncovered from online lives. Derbyshire’s Assistant Chief Constable Bill McWilliam said: “We of course understand that police activity of this nature can be unsettling. “However, please be reassured, the arrest we wanted to make has been made.